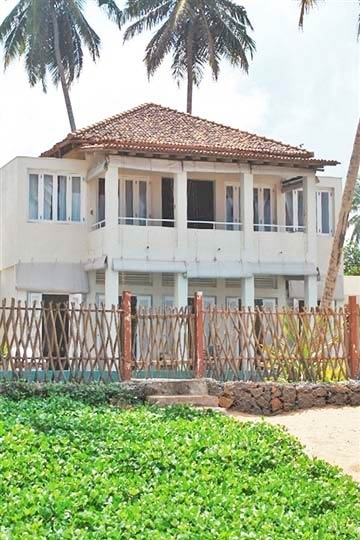 Nisala, meaning ‘peace’ in Sinhalese, might have fewer bedrooms than its neighbouring Sri Villa properties (four-bedroomed Araliya and three-bedroomed Sagara ), but it has the most expansive living areas. From Nisala, the large shared pool is easily accessed via a central shallow section making this villa especially suitable for families with young kids. From the comfort of the cosily furnished front terrace mere footsteps from the shimmering water, parents can also watch their little paddlers with ease as they splash about in the pool or chase each other around a garden that’s separated from the beach by a rickety wooden fence. 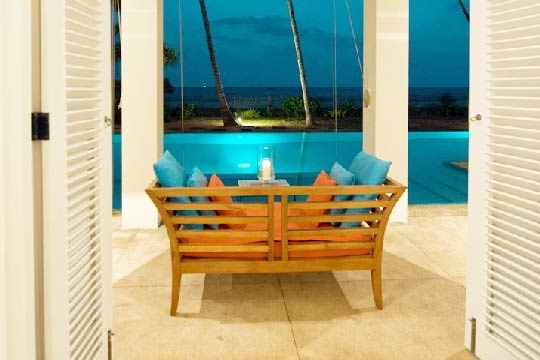 As the middle of the three Sri Villa properties, Nisala has the widest ocean frontage and this results in it having the best sea views from either of its two identical top floor suites or the spacious living and dining areas below. If all three villas are booked together this one has the most potential for entertaining; three dining tables could easily be fitted end to end in its elongated living room whilst the open kitchen behind has a concrete top that would work well as a bar. 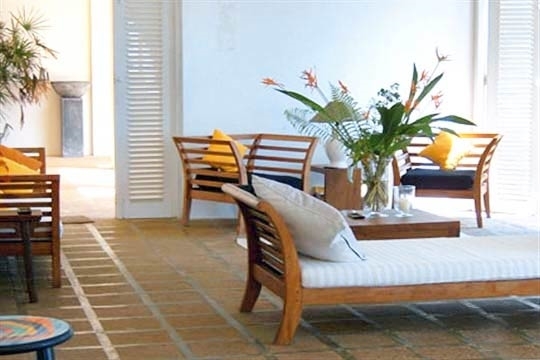 Sri Villas is more sociable than serene and designed for conviviality rather than solitude. Even if you don’t know your neighbours before you arrive the chances are you’ll know a little more about them by the end of your trip; a quick discussion in the pool might turn into something long lasting as you push tables together for dinner and share a beach BBQ under the stars. Of course, the three owners of Sri Villas – themselves lifelong friends who have enjoyed the sociability of communal holidays - created the property with this in mind. Renting these three fully-staffed villas together and having them exclusively to yourselves is an excellent option for big groups; it’s economical too since the villas operate a grocery system for food so all you pay for is the cost of the ingredients. With direct access onto a beautifully wide stretch of beach, Sri Villas is also a wonderful place to host events such as birthdays, weddings and family reunions. 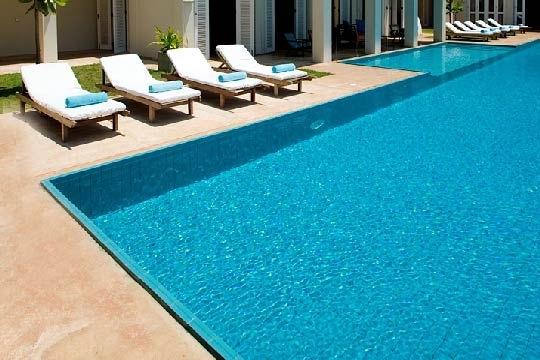 Nisala has the best pool access and sea views of the three villas. 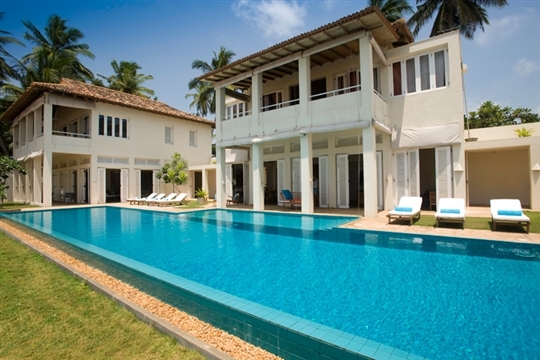 Nisala is located to the south of Induruwa, and only a ten minute drive to the famous resort of Bentota. 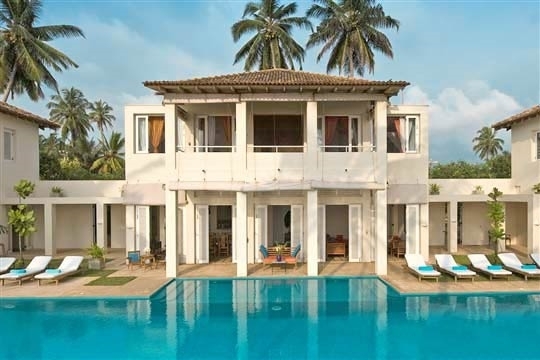 Situated between the main Galle Road and the extensive golden sandy beach, Nisala is neighboured by the other two Sri Villas properties Araliya and Sagara. Village homes in Induruwa are generally strung out along this stretch of coastline with small boutique hotels and bigger resorts scattered in between. Because of the southwest monsoon, it’s best to visit between December and April as the sea can be rough and the winds strong at other times of the year. 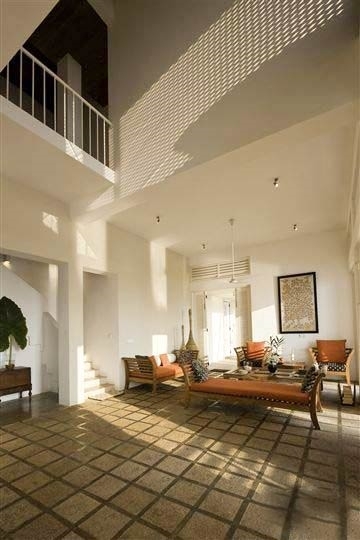 Since Nisala is situated in the middle of the Sri Villas trio, there are two entrances into the villa; one to either side of the living room. 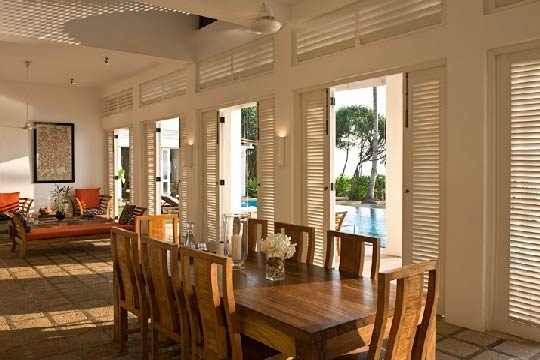 Using plenty of local materials in its construction, the villa has a contemporary tropical design reminiscent of Bali, with features such as tall louvered doors, stone floors, modern timber furnishings, calming pebbles and earthy colour schemes. The ground floor of Nisala comprises a huge open-plan living and dining area plus a fully-equipped open kitchen to the back with concrete half-wall that could be used as a bar. To the front, numerous tall louvered doors open across pebbles onto a front terrace that’s only a few footsteps from the pool and furnished with easy chairs. To one end of the ground floor is a lounge area with a few books and magazines and plenty of comfortable chairs, whilst to the other end is a dining table seating up to eight. Among the contemporary furnishings are a few antique pieces such as a painted cabinet and an aged temple door that’s used as a coffee table. Steps lead up from the ground floor at the back of the villa (where there’s also a washroom) to the two suites above, both of which are identical in design. Each has excellent views over the pool, garden and sea from inside as well as from their shared front balcony. 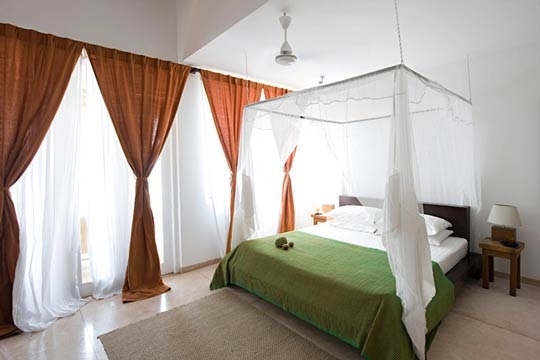 Both suites have air conditioning and ceiling fans, and feature double beds with suspended mosquito nets, built-in storage space, a safe and an ensuite concrete-finished bathroom to the back with shower and unusual trough-shaped stone sink. 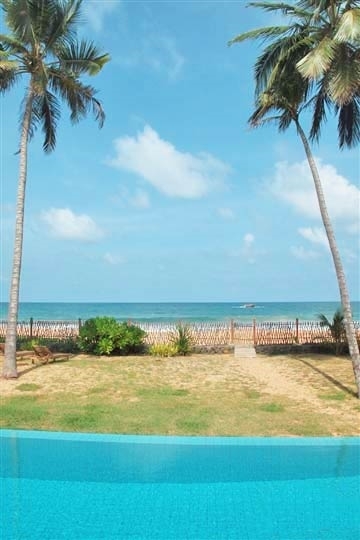 2 bedroom villa located in Bentota, West Coast. Ideal for Beachfront, Body and soul, Kid friendly, Fair share for groups, Sensible for seniors, Room with a view, Perfect for weddings.